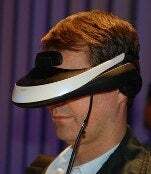 Sony's Personal 3D Viewer, introduced at the IFA consumer electronics show, will offer consumers an alternative to 3D televisions and will be available by the end of this year, according to the company. Watch a video for a closer look at the gadget. The product is shaped like a visor and rests on top of a user's head. Once it's positioned and focused, a wide, clear and bright 3D image can be seen. "We can provide with this gadget that home theater experience," said Yoshinori Matsumoto, Sony's General Manager of home entertainment. "That means a 750-inch screen at a 20-meter distance." Inside the viewer the images are displayed on two 0.7-inch OLED panels, each with a resolution of 1280 pixels by 720 pixels. The unit can be connected to a 3D camcorder for a live view of what's being shot, or used for movies and gaming. "Imagine watching Spiderman swinging before your eyes or playing a game like Uncharted 3 in breathtaking 3D right in front of you," Sony CEO Howard Stringer said during the company's IFA press conference. The gadget also includes headphones. Sony wouldn't say how much the device will cost.